Gripclad GRP Anti-Slip Stair Tread covers are a complete one piece section which includes a drop-down nosing over the stair riser, this allows the edging to be colour contrasting which assists the visually impaired to define the step edge when descending or ascending the stairs. It will resist the high footfall and impact for many years without any wear or tear, making it ideal for any school premises. Need Advice, Quote or a Sample? 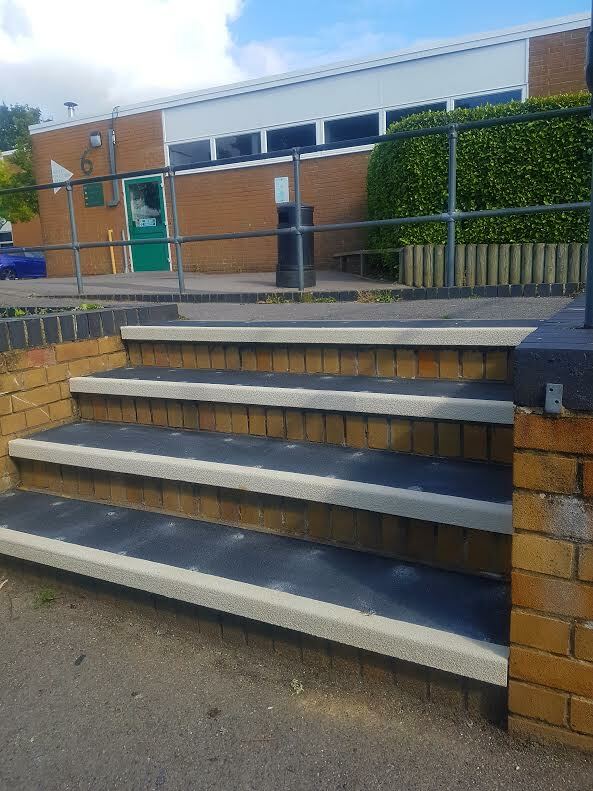 This Secondary School was in dire need of an upgrade to many of their external steps which posed potential slip hazards to the high number of students. The steps around the school were wearing out. Mis-stepping occurred when the highlighted white edging had faded. The paving slabs when wet were extremely slippery and with the high number of student foot traffic the risk of slipping was high. All step edges and nosings needed a contrasting colour edge to define the step edge, especially to help those visually impaired. The school's facilities manager wanted high wear resistant stair covers that offered good slip resistance and that looked better than before. Gripclad GRP Anti-Slip Stair Tread covers in Black colour with a White contrasting nose edge was specified. The school took the opportunity to use a long-lasting anti-slip product that requires almost zero maintenance, apart from periodic cleaning. Unfortunately, many schools opt for a quick fix such as paint which is a short term measure and which needs constant repainting of the edges. Our contrasting colour cannot wear down, and the anti-slip grit cannot be knocked out as happens with over-coating methods.